PC chassis and cooling specialist NZXT has dipped its toe into the waters of software design by launching its new software, simply called 'CAM'. The software tool is free to download – no NZXT components are necessary. NZXT boasts that its software "is more than just a monitoring tool," and rather likens it to a PC "companion" application. Let's have a look to see what is on offer here. CAM does provide system monitoring functionality as a cornerstone of its offering. The appealing 'flat' modern design interface offers details about your PC specs, important sensor readings and real-time graphs charting CPU, GPU, Fans speeds etc. To compliment that information dashboard CAM has a notifications centre to alert users of any (impending) problems it senses. 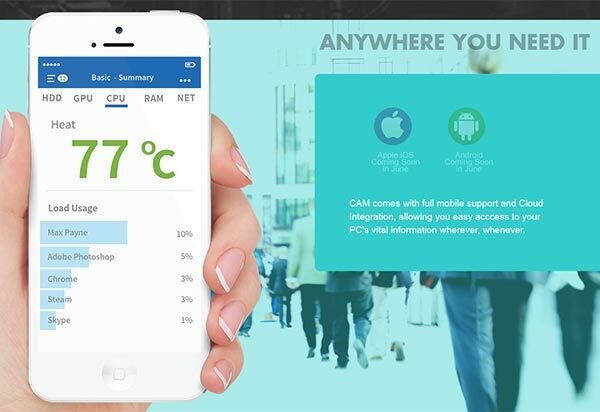 From next month CAM will have full mobile and cloud integration. This will allow you to monitor your PC health and other status remotely. Also, for instance, you could use your smartphone/tablet as a monitoring screen while your computer is busy doing something else. NZXT says that CAM offers a unique feature that pushes it past the realms of simple monitoring software, it's proactive notifications, "It is the first monitoring software to provide meaningful notifications in real-time about things such as suggested upgrades, critical issues, malfunctioning hardware and more," we are told. CAM is available to download now for Windows 7, and newer, users. The install file weighs in at just over 60MB. As mentioned previously, the Android and iOS companion apps are due next month. This freebie might be worth a try if you find the monitoring software you currently use unappealing or clunky, for example. What do readers think about NZXT's first software step to help "the growth and development of the DIY building community"? Think I will give this a go as the monitoring software that came with my mobo does not work well in Windows 8 at all with certain modules of it refusing to install and others failing to load. Could be a useful app (especially with the phone app to come) but am concerned as to what the angle is here that NZXT are working. Surely they are not doing this out of the kindness of their heart so how are they going to make money out of it? They are probably selling their name rather than the app itself. They won't be able to sell this for much anyways so it won't be about making profit but more free advertising for their brand. I use their sentry 2 myself and have no problems with their monitoring software or hardware. "It is the first monitoring software to provide meaningful notifications in real-time about things such as suggested upgrades, critical issues, malfunctioning hardware and more". See, there's yer problem, mate… yer PSU is knackered, yer case is busted and yer cooler is up the duff. Suggest ya replace them with something better… which we *just happen* to sell! Our software has detected your credit card number and is currently purchasing products it thinks you need.